Yaima Comas, the eldest of four siblings who moved to Sarasota from Cuba with their father in 2005, advises her younger brother and sisters to “take things seriously and pay attention to your studies.” Having escaped Cuba’s political oppression, and potential imprisonment for his beliefs, Yaima’s father values the freedom that education offers. She is motivated to learn as much as she can, to achieve her goals and make her father proud. Daphne Weeks also faced many obstacles in her younger years, but she is determined not let her past define who she is. Her goals clearly developed and she has plotted her course to success. Thanks to the foresight and generosity of former Plymouth Harbor residents Mildred and Bernard Doyle, both Yaima and Daphne will receive the financial support needed to help them achieve their educational goals. The Mildred and Bernard Doyle Charitable Trust was established as a means to provide ongoing educational assistance to “a worthy and needy child of an employee of Plymouth Harbor” or “a worthy and needy employee seeking to increase their skills or to obtain a higher education.” This was the result of their great affection for the employees they had come to know so well during their residency at Plymouth Harbor. Twenty-five scholarships have been awarded to Plymouth Harbor employees and their children since 1999. Each year a scholarship committee at Northern Trust Bank, which includes former Plymouth Harbor executive director Jack Smith who knew the Doyle’s well, selects two recipients of the $5,000 scholarship. The two recipients this year could not have been more surprised or elated. Each had put considerable effort into the application, but they knew the competition for this honor is stiff. When Daphne and Yaima were invited to join a gathering of Plymouth Harbor’s management team on May 30, Daphne may have suspected the reason. Before President/CEO Harry Hobson could even announce this year’s Doyle scholarship winners, tears were spilling down her cheeks. “I was speechless and overwhelmed when I heard the news,” exclaimed Daphne. Daphne’s heartfelt emotion was contagious and before Harry finished his congratulatory speech, there were few dry eyes in the room. Currently serving as a certified nursing assistant (C.N.A.) in the Smith Care Center, Daphne says she has always dreamed of pursuing a career in nursing. 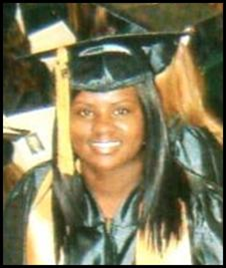 She began early with dual enrollment at Sarasota High School and Sarasota County Technical Institute, earning her C.N.A. when she was just 17 years old. She wanted to immediately earn an LPN, but there were hurdles and obstacles to conquer before this would be possible. 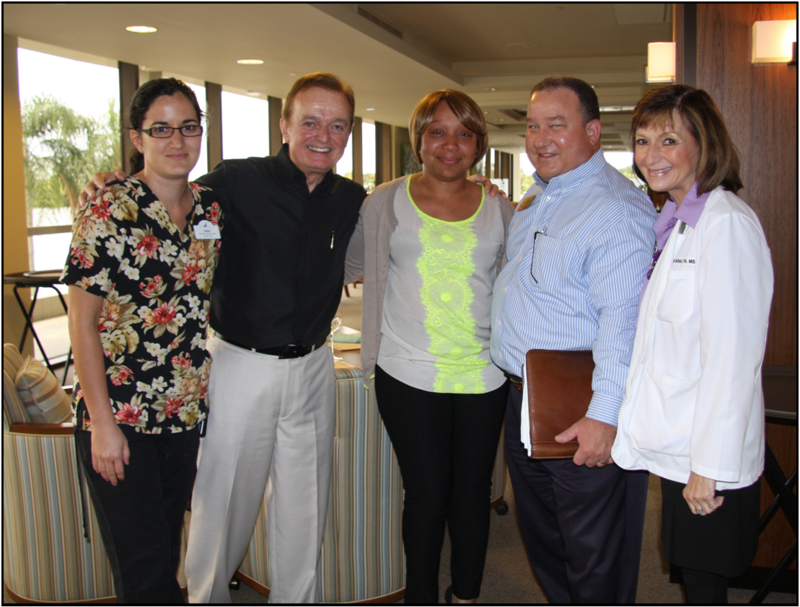 Daphne has served the residents of Plymouth Harbor for four years, first in the Callahan Center. Now she feels her way is clear and she is laser-focused on attaining her end goal of earning a master’s in nursing. The past is not something that Daphne wishes to dwell on. Having paid attention to the devastating impact of human trafficking and domestic violence in the community around her, she hopes to eventually work with young women in these situations and help to set them on a positive path. 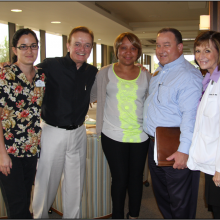 This past month Daphne completed her AA in Arts, a prerequisite for State College of Florida’s nursing program. It will take four more years to complete her undergraduate degree and then, with the good grades she intends to earn, it will be on to the graduate nursing program at Florida State University. “I keep a positive attitude and just concentrate on my studies,” Daphne shares. “I know it will be challenging, but I have prepared myself for this journey.” In the end, who knows, she may well change the world, one confident young woman at a time. “I’m a numbers person, not science,” divulges Yaima. Although she is an excellent C.N.A. providing Home Care and Home Health Agency support, it is clear her rewards come from helping people in ways beyond the clinical aspects of nursing. “I feel I can help more people in medical administration,” she adds explaining her choice to earn her bachelor’s degree in health care administration, which will take another two years of study at State College of Florida. During her 3-1/2 years on staff at Plymouth Harbor, Yaima has thoroughly enjoyed working with her coworkers. The fact that the team has kept the same members throughout this period is evidence of the dedication and commitment of Plymouth Harbor employee service. In Home Care, Yaima appreciates the flexibility she has to serve and speak with residents on an individual basis. Sharing their lives is a most rewarding aspect of her work and reminds her of the extended family she left back in Cuba. Working full-time at Plymouth Harbor and attending classes part-time, she is motivated to succeed academically. Where will Yaima be ten years from now? She plans on being a manager in a public or private medical facility or hospital and continue to realize the dream of freedom that led her father to escape to the U.S. with his family. While Yaima and Daphne are just beginning their educational journey, they would do well to look to another early Doyle Scholarship recipient for inspiration. Crystal Chapman, daughter of Home Care LPN Bridget Chapman, was first awarded the Doyle Scholarship in 2002 and received it for four subsequent years. As a single mother raising two children at the time, Bridget recently shared with a Foundation Forum audience the impact the scholarship had on Crystal’s life and her ability to achieve her goals. This was certainly money well spent, an investment in every sense of the word. 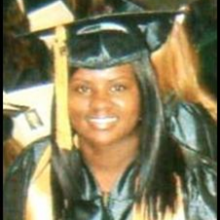 In 2006 Crystal received her bachelor’s degree in nursing, and in 2009, her master’s degree in nursing. In 2013 Crystal earned a Ph.D.
Dr. Crystal Chapman Lambert is now an Assistant Professor of Nursing at the University of Alabama at Birmingham. Mildred and Bernard Doyle were touched by the staff who made their lives at Plymouth Harbor abundantly better. Their generous gift in return, expressed through the Doyle Scholarship, is truly changing lives.